Panasonic DMP-BDT100 review | What Hi-Fi? This Panasonic's price makes it immediately tempting. Officially valued at £280, it's already available for just £225 with minimal shopping around, and that's enough to make it nigh on irresistible. Bear in mind, though, that this isn't wireless from the box, and that a wireless adapter will set you back around £65. You can, of course, simply use an ethernet cable to connect the unit to the internet, and it's well worth it for the regular firmware updates, if slightly less so for the rather uninspired selection of web services, of which YouTube is the only real highlight. But presumably you're buying a 3D Blu-ray player because you want to watch 3D Blu-rays; and here the Panasonic is very good indeed. By the standards of this still-settling technology, 3D pictures are stable and controlled, and there's a vibrancy to the delivery that enhances the animated films that make up the still limited catalogue of 3D titles. The very best available produce slightly crisper pictures, which enhance the three-dimensionality of the picture, but the Panasonic is right on their tails. Switch to a 2D Blu-ray like The Dark Knight, and those traits remain true. It's not the very sharpest player around, but it's close, and it also has punchy whites and colours and impressive black depth in the frequent night scenes. The brilliant motorcade battle also proves that the Panasonic is a very capable handler of motion. If you'd like the Panasonic to upscale your existing DVD collection, it will do a good job with that, too. Funny People is clean, controlled and colourful, with smooth edges and impressive detail levels. The Panasonic, then, is right at the top in terms of picture, and the differences at that level are fairly slim, which can make your buying decision a rather difficult one. Sonic differences are a little more clear, though. Where key rivals (okay, Sony) major on ultimate precision, pace and detail, the Panasonic produces a warmer, weightier, more flowing delivery. It may be a little harder to place each individual effect, but the overall surround field is open, spacious and authoritative, and explosions are chunkier and deeper. Which you prefer will come down to individual taste. 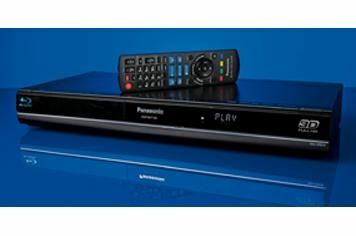 We can't help but be a little disappointed with its limited internet services, but there's no denying that this Panasonic is otherwise a very serious contender for the top spot.